This year's early start to Black Friday proves Thanksgiving as you know it is gone. American consumerism has triumphed. For all the talk of boycotting stores that opened on Thanksgiving Day, the crowds showed up anyway. Big-name retailers, like Target (TGT), Wal-Mart (WMT), Best Buy (BBY) and Macy's launched their Black Friday sales in the evening hours Thursday, while Kmart opened even earlier, at 6 a.m., with plans to remain open for 41 hours straight. Mall managers across the country said shoppers still arrived in droves but the earlier openings led to a smoother flow of traffic throughout the night, instead of the usual rush at midnight. Edward Larson, who manages a J.C. Penney in Great Falls, Mont., said customers were "more purposeful and not as frenzied." The Town East Mall in the suburbs of Dallas opened at 8 p.m., and thousands made their way to Macy's (M), Sears (SHLD) and J.C. Penney. (JCP) Their demeanor was more calm and reserved than in years past, said mall manager Chad Hastings. Related poll: Is Black Friday worth it? "This is definitely a game changer," Hastings said. "In future years, the customer will expect stores to open at 8:00." The earlier start also meant that foot traffic dropped off in the morning's early hours, an unusual sight. South Florida's Aventura Mall was nearly empty at 5 a.m. Even those who stayed home found it hard to resist the deals, with a record number of people shopping online Thanksgiving Day. Department stores tallied 20% higher online sales on Thanksgiving Day alone this year, according to data collected by IBM. Just over a quarter of them used their smartphones to make purchases. Shoppers say workers should be home with their loved ones. But it won't stop them from heading out anyway. "I don't like that the hours are earlier. I think people should be able to be with their families on Thanksgiving," said Kim Schaefer as she shopped for shoes at J.C. Penney. At a Target in Philadelphia, Qiana Roberts skipped Thanksgiving dinner for a spot in line. Collin Cook ate extra early on Thursday to join the masses at J.C. Penney in Wayne, N.J.
"We're a service industry," said Wal-Mart's U.S. CEO Bill Simon. "If the traffic is any indication, they clearly want to shop on Thursday evening. We'll provide that for them." Randy Tennison manages the Jordan Creek Town Center near Des Moines, Iowa. For years, they opened at 5 a.m. on Friday. Then it got pushed back to midnight in 2006, then 8 p.m. Thursday this year. His family has adapted and made Thanksgiving a lunch affair, but this year he had to cut that even shorter. He doesn't mind, because it's good for business. Foot traffic at his mall last night was 11% higher than last year. Ishamar Dorma cut out of Thanksgiving festivities a little early to hit the West Philadelphia Target around 4 p.m., four hours before the doors opened. He turned 23 on Wednesday and wanted to get himself a belated birthday gift: a large, LED high-definition TV. The 50-inch Element TV going for $229 instead of $600 was one of many discounts beckoning shoppers. There was also half-carat diamond earrings priced at $79 and side deals like Target's $100 gift card with every iPad. That last one convinced Charlie Wu to brave the freezing weather outside a Target (TGT) in New Jersey. "I'll buy as many iPads as they'll let me buy," he said. Some will go out as gifts. But he said he'll take advantage of the temporarily low prices and sell the rest online. On the bright side, shoppers said it was a calmer experience this holiday season. The typical rush into stores gave way to cool-headed families meandering through store aisles, perhaps still under the sleep-inducing effect of a full-sized dinner of turkey and cranberry sauce. 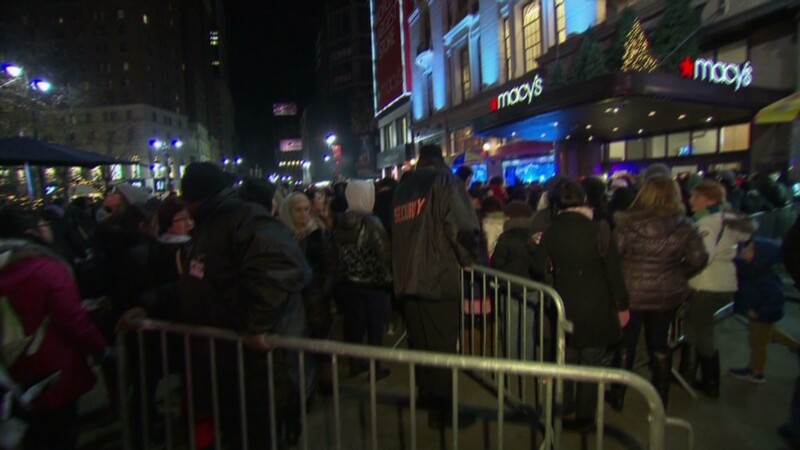 "I wouldn't have gone out on Friday -- it's too crowded," said Ann Delrio, who took to a J.C. Penney in New Jersey. The sales numbers showed the calm as well. Disney Store executive Paul Gainer watched as the nation's 216 locations reported their transactions every hour to the company's headquarters. "It's felt very controlled and spread out with the extended hours," he said. The push to open stores Thanksgiving night resulted in a year-over-year 13% decline in brick-and-mortar store sales on Black Friday, according to the retail industry research firm ShopperTrak. However, sales for the two-day period were 2.3% higher. It didn't go smoothly everywhere, though. There were reports of Black Friday fights. In Claypool Hill, Va., police say a knife fight over a parking space outside a Wal-Mart (WMT) led to one person stabbed in the arm and two arrests. On Twitter, the hashtag #WalmartFights became a top search term as people posted videos of violent brawls over low-priced products. "Anytime you get more than 22 million people together, you get some behavior people aren't proud of," said Wal-Mart's Simon.